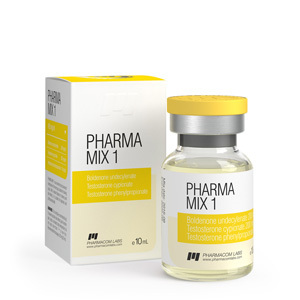 Pharma Mix 1 (450 mg / ml, 10 ml) from PharmaCom Labs (Moldova) is a composite steroid preparation that includes 3 steroids that are effective for sports use: boldenone undecylenate, testosterone cypionate and phenylpropionate. The manufacturer itself describes the drug as a working mixture for a set of muscle mass, with an optimal balance of beneficial and side effects, equally recommended for beginners and experienced athletes. As a composite drug, Pharma Mix 1 has all the effects of its steroids: during the course it effectively promotes anabolic and interferes with catabolic processes (promotes recruitment and prevents the destruction of muscle mass). But the action that is valuable for athletes is not limited to this, because it also develops the strength, endurance and performance of the person using. Additional effects of PharmaMix-1 from PharmaCom Labs include possible enhancement of pumping, aggression, appetite and libido, fat burning, increased venous muscle drawing, even the development of secondary male sexual characteristics, due to the androgenic properties of steroids. Who recommends PharmaMix-1 for sports? Representatives of virtually any physical sports. Due to the wide range of effects, the composite steroid (steroid mix) stimulates the results of muscle development in bodybuilding to increase the power potential in powerlifting. This Pharma Mix 1 is definitely not recommended for women. Due to the inherent androgenic properties of the drug, the athlete runs the risk of virilization (side effects like acne, aggression, body hair growth and more critical). The possible side effects of pharma mix-1 450 for men: androgenic, from acne to baldness, and estrogenic, from fluid retention to gynecomastia. It is important that, while following the recommendations, the side effects are rare and mild, in fact, not overlapping the benefits of the drug. PharmaCom Labs describe predominantly laudatory. Ambiguous opinions, if they occur, are usually the result of errors made in the preparation and conduct of the course of application, in the training program or nutrition of athletes.